Items 239- out of displayed. The EURUSD has turned down from above 1.3700 area where we labeled end of an expanded flat formation that now shows signs of completion after sharp fall down to 1.3500. 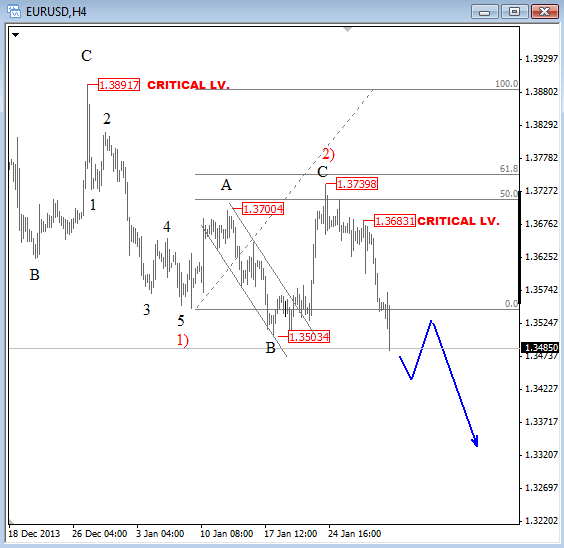 Current decline is showing signs of an impulsive price action so we suspect that EURUSD is heading much lower. Trend is down as long as 1.3683 remains in place. 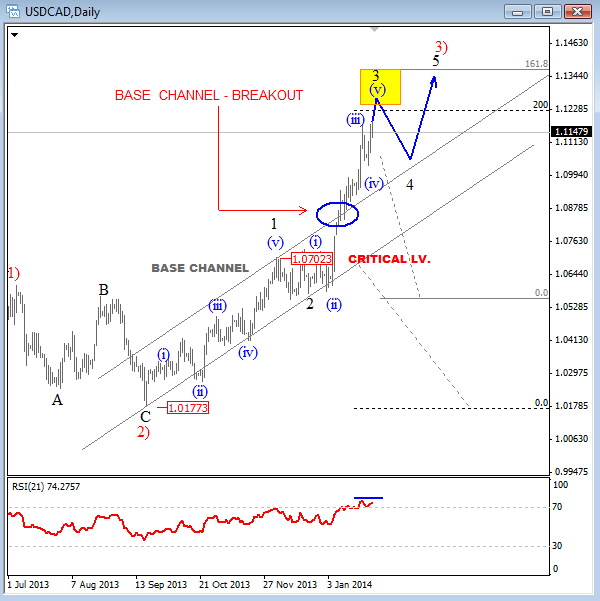 USDCAD is moving nicely to the upside, most likely trading higher within impulsive structure after recent strong and sharp extended move up from 1.0580. Based on the personality of the move and acceleration after break out of the base channel, we suspect that pair is in wave three of three, typically the strongest wave in the sequence. However, we see some Fibonacci levels at 1.1200 and 1.1380 zone where pair may find a temporary resistance, but only temporary for a pullback down in black wave 4 to that base channel where upper trendline may cause a new leg up on the pair. 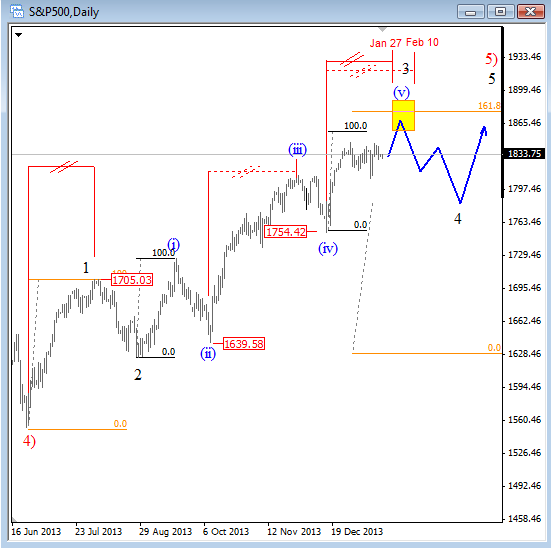 S&P500 reversed back to new all time highs recently after completed corrective retracement at 1754 in mid-December which was wave (iv) within larger wave 3. As such, price is now moving up in wave (v), final leg of a five wave move that could stop at 1850-1880 projected Fibonacci zone. From that region we expect a deeper retracement back in another fourth wave, but of a higher degree. We are talking about black wave 4 that could get underway in February. 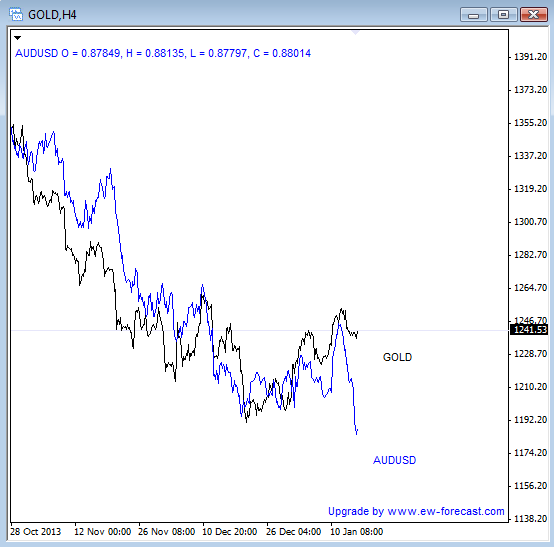 GOLD did not move much lately, but price seems to be lagging compared to AUDUSD. Notice that these two markets where moving nicely together in the last couple of months so we suspect that correlation will get back to normal. As such, with more downside in view on AUDUSD we think that GOLD will also turn south. It seems that crude oil is finally forming a reversal that we have been looking for after five legs down from above 100.70. We think that current leg up represents part of a deeper corrective retracement, labeled as wave (ii) that may reach 94.25 maybe even 96.00 area before downtrend may resume again. Keep in mind that this market has been falling strongly lately, so contra trend move or larger pause should not be a surprise. 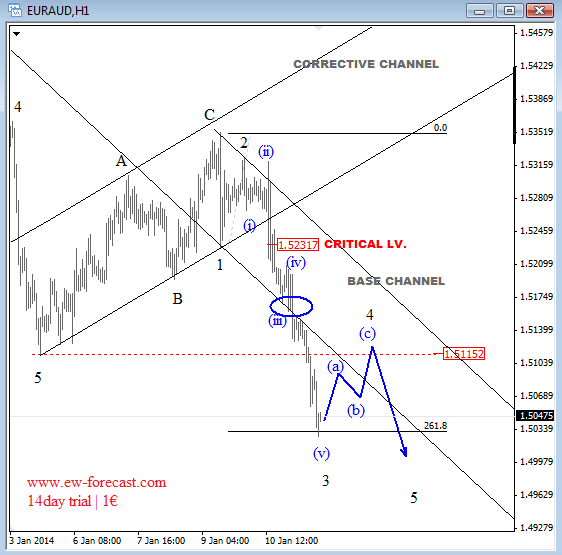 I really like the wave structure on EURAUD at the moment. I see nice accelerating downward price action following the break out of the base channel that usually confirms the idea of a wave "three" in progress that is part of a "five wave movement". If our bias is right, then shorting pullback should be interesting after any three wave retracement. At the moment we don't have that yet, but (a)-(b)-(c) up into 1.5115 area could be nice, where former lows may turn into a resistance for a decline down in wave 5. 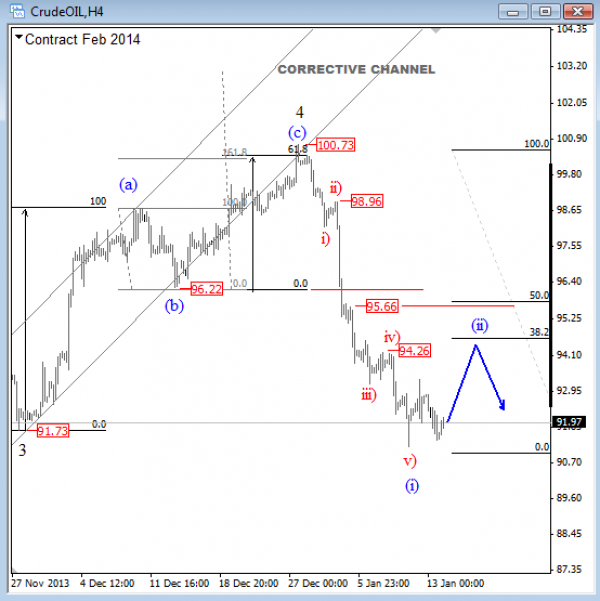 Below it's video update on Crude Oil that has turned nicely down from 100-101 Fibonacci resistance area recently. Decline looks to be in five waves, so be aware of more weakness after the pullbacks.